Sweet Cheeks Adventures: $100 Sears Gift Card Giveaway -- Shop Your Way! 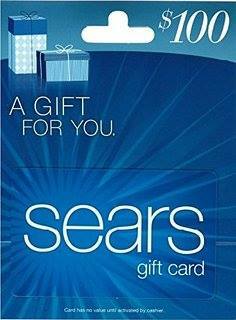 $100 Sears Gift Card Giveaway -- Shop Your Way! Typically, I like to be finished shopping by mid-November. And, it seems stores are catching on to the early shopping craze. Stores like Sears. For example, this year Sears is offering a Member Bonus Event On Sunday, October 16 from 6 p.m. to 9 p.m. "Shoppers will have the chance to check items off their holiday shopping lists early this season at Sears Member Bonus Event and score some greats deals." Which is perfect for me because I have a few things I need to get and plan to get them at Sears. My husband loves Sears so shopping for him is always easy. He's been wanting a new tv and I think I've found the perfect Samsung 55" Class 4K Smart Ultra HDTV at Sears! And, since I'm a Shop Your Way Member I'll earn 18,980 points with this purchase. I'm not really concerned about buying it now and having it go on sale between now and Christmas because Sears is offering something they've never offered before. "To ensure members receive the best deals offered during the holiday season, Sears is introducing a Holiday Guarantee – essentially “insurance” on purchases made during the Member Bonus Event. To become a Shop Your Way Member sign up here." To help you kick off a fabulous holiday season, Sears is offering one lucky Mom Blog Society reader a chance to win a $100 Sears gift card. For your chance to win, simply enter via the Rafflecopter below. Thanks so much for the chance to win! Love Sears & the shop your way rewards program! This would help out with Christmas! Thank you so much for the awesome giveaway!